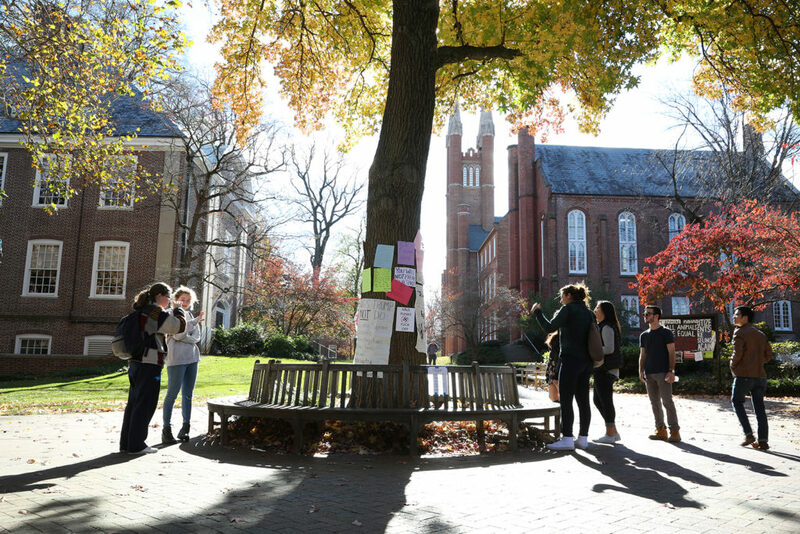 Last Thursday, the words, “Bassam Eid is a traitor” hung on the protest tree for all of F&M’s campus to see. Who is Bassam Eid? Why is he a traitor? F&M had many questions–not only about this week’s speaker, but also about the complicated sociopolitical and historical conflict between Israel and Palestine dating back over fifty years. Because of this, Eid’s arrival to F&M was the catalyst to increased amounts of debate, conversation, and the immersion of complicated international politics into the discourse of daily life. A key point of contention, though, among those who are familiar with Bassam Eid and his political affiliation, was the weight of having someone haphazardly labelled as a “traitor” come to F&M in the first place. Bassam Eid is a pro-Israel and pro-Palestinian activist who grew up in Shuafat, a United Nations refugee camp outside Jerusalem. As a native Palestinian, Eid has been exposed to the Israeli-Palestine conflict for his entire life, as well as the human rights violations in the Gaza strip area. As someone who has been on the ground, seeing the scope of authoritarian devastation, he has come to a unique political position: abandoning the idea of a nationalized “homeland.” Instead of his opinions strictly supporting nationalized politics, he has offered years of neutral criticism, both to Israel and Palestine, criticism that has received enough media attention to warrant threats of brutal violence, and even death. The Common Hour itself lived up its high anticipation, garnering an attendance that was unusually high. As Eid began to speak of the Israeli-Palestine conflict, his highly controversial opinions forced the air within the Mayser Gymnasium to turn still. It could be easily felt how attentive the audience was to Eid’s sharpened words, taking vigorous notes, as if everyone was trying to absorb as much of Eid’s presentation as possible. As is Common Hour tradition, students were encouraged to ask Eid questions at the end of his presentation. Almost immediately, many F&M students rushed to the microphone, anxiously awaiting the chance to speak with the revered yet controversial speaker. The staff running Common Hour had to actually dismiss the Q&A, cutting off some students, because time had run out. The fact that students so passionately participated in the Q&A session, as well demonstrated pre-presentation hype through the posts on the protest tree is incredibly important. The example set at Eid’s Common Hour means that F&M students want speakers who present pressing, high-stakes issues to campus. The students want to engage in political discourse, want to be challenged, not only by the academics in which we undertake, but also in the discourse of everyday life, with Common Hour as a main fixture. However, high-stakes discourse, like the kind presented by Eid’s talk, doesn’t happen all the time at F&M. More often than not, Franklin and Marshall’s campus can tend to err apolitical, straying away from the heat, preferring to remain comfortable and safe within social acceptability. Critical conversations on international politics, racism, sexism, xenophobia, and other seemingly uncomfortable topics have select days where they are normalized, with Day of Dialogue as a principled example. Students need to take responsibility in making sure that the knowledge gained through our studies don’t live and die in the classroom. Conversely, F&M should not shy away from the opportunity to engage in critical conversations on pressing issues. A lot of the dialogue surrounding politicized issues begins with the introduction of a controversial speaker. Without a person coming to F&M to spark interest and conversation, crucial issues remain just theoretical. Theory isn’t enough for an institution as prestigious as F&M. Theory isn’t enough for students who all have the capability to make real, lasting change.